16 Oct Calories, Meal Timing, Or Macros? Let’s Cut Through The Clutter. Should I be tracking my calories or just my macros? Do I need to eat every 2-3 hours for fat loss? Can I eat past 7pm or does the magical carb fairy sprinkle fat dust on my food at that time? These are some of the most common questions I get via Facebook and Instagram weekly. My job for private clients is to make things VERY simple and effective for them to follow. So, I am going to break down the FIVE most important components when it comes to prescribing a simple and effective nutrition protocol for a client. These five things, in order of importance, are all you need to be concerned with to see amazing results. Everything else is just details my friend. Wan’t to lose weight but you aren’t in a calorie deficit (eating less calories than it takes to maintain your body weight)? Good luck. Nothing else will ever out rank this first component. You need to consume LESS calories than it takes to maintain your body weight in order to lose weight. We can do that through nutrition, or exercise, or a combination of both (the approach I prefer with my clients). Don’t argue laws of thermodynamic and chemistry here. I don’t care if you are eating SUPER CLEAN. OK so we have placed you in a calorie deficit, now next on the importance scale is prescribing the proper ratio of macronutrients. My goal isn’t just to help a client lose weight, but to also get them to feel PHENOMENAL all day long. I can’t achieve this if we aren’t balancing protein, carbs, and fats properly. Plus, if your goal is to actually lose fat and not just weight (there is a difference) you will want to ensure you have adequate levels of dietary protein in a calorie deficit. If your dietary protein is too low, and you are training intensely while in a calorie deficit you run the risk of losing that hard earned muscle. Especially if you are trying to obtain a very low level of body fat. Now I individualized my macronutrient prescriptions for each client, but a great starting point for anyone would be a 40/30/30 break down. So, 40% of calories from protein, 30% from fat, and 30% from carbs. 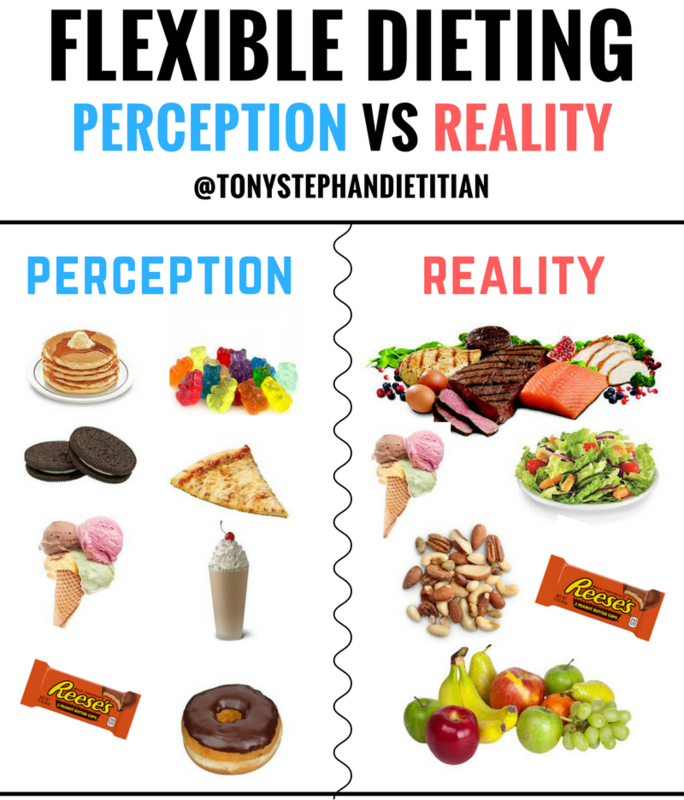 Uneducated individuals assume that when we say a “flexible” approach to weight loss that we mean eat Twinkies and donuts all day long and just fit it into your macros. It goes completely against the oath I took as a Registered Dietitian to fight disease one veggie at a time (there isn’t a real oath like that). After I place a weight loss client in a calorie deficit, and prescribe proper ratios of macronutrients, next on my importance scale is assuring they are choosing nutrient dense foods daily and building 80-90% of their intake with those foods. 10% for fun foods and flexibility has worked extremely well in the past for my clients. Consuming 28-35g of fiber daily is a great way to mitigate hunger cues and keep you full and satisfied when calories become lower. I see so many people stress about when they eat their meals. Eat when it’s convenient for you! As long as we achieve the above three principles, then meal timing DOES NOT MATTER! You have so much in your life to stress about like time, finances, and relationships. Don’t let your meal timing be one of them. If you want to eat five meals per day, cool do that. If you prefer three meals and two snacks in between, cool do that. I have busy clients and they all have to eat at different times that are convenient for them. They all see results, regardless of when they eat. Back in high school my friend George and I went into a GNC one day. The greeter asked George and I what brought us in that day. I see so many people who, like George, want that quick fix or the over night solution. Instead of addressing the above four more important principles, they want to jump right into taking the magical pill, powder, or potion. You know what they say about the truth right? It will set you free but first it’s going to piss you off. There’s no magical supplement that will take the place of the above principles. I personally don’t use fat burners or recommend them. I’ve had plenty of success addressing the above principles without the need of any fat burners support. Supplements, as the word suggests, supplements proper nutrition, training, and recovery. Supplements alone do NOT produce results. Three supplements I do stand by as support agents are a quality multivitamin, fish oil, and protein powder (if a client needs help augmenting their intake). The most important components in the order of importance for weight loss. If you implement the above principles and focus on consistency over time, you will be successful with whatever nutrition or fitness goal you want to achieve.